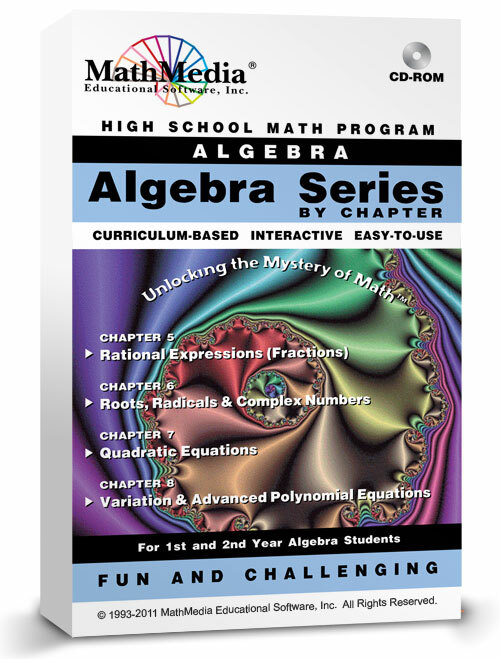 The second semester set of this algebra software is appropriate for second semester algebra 1 students, first semester algebra 2 students & college algebra students. Algebra help is available from each practice question. Performing operations of addition, subtraction, multiplication, and division on fractions is always a challenging topic for students. This program reviews the basics operations on numerical fractions before advancing to operations on algebraic fractions. Also, included in this program are negative powers and scientific notation. The study of algebraic fractions concludes with a word problem section using the learned material from the body of the program. Follow the progression from simplifying roots and radicals, through the properties of radicals. Practice sums of radicals and learn about binomials by rationalizing denominators and applying FOIL (multiplication of binomials). Solving radical equations are practiced. A thorough discussion and practice involving rational and irrational numbers is followed by an in-depth study of imaginary and complex numbers. The problem solving section and test conclude this program. Begin the study of quadratic equations by learning the ever-important method of "completing the square"... followed by Algebra's most eloquent formula, the "Quadratic Formula" -- practice, practice, practice the important use of the quadratic formula! Learn about the Discriminant and what it reveals about the nature of the solutions (are they real, non-real, rational, irrational). Use the quadratic formula and other methods to solve a variety of quadratic equations from simple to complex. Learn to graph and analyze quadratics -- learn what to look for -- the key elements which comprise a good and accurate graph (the vertex, the axis of symmetry, the x-intercept(s), the y-intercept(s). Apply the sum and product rules for finding a quadratic equation given the roots of the equation. Conclude with word problems and a test. Every section of every program has a corresponding quiz to test the student's achievement. Scores are calculated and automatically sent to the included database. Use the quizzes for placement or accountability. Once the students have proven proficiency, they will take the Practice Test which contains questions from all the learning sections in the chapter and includes HINTs and solutions. After the Practice Test, students will take the concluding Chapter Test which will be scored and recorded.